How To Ensure Safety With Portable Heaters. Portable heaters provide solutions to heating in multiple locations. They are quick and simple to operate and will provide good value if they are used carefully and sensibly. However, any type of portable heater can start a fire if it is misused. Always follow the manufacturers operating and maintenance instructions. Keep them clean and serviced regularly. Pay special attention following a period of storage or after a seasonal break. Ensure a room is ventilated if using a gas based heater. Ensure staff turn off portable heaters before leaving for the evening. Do not move the heater while it is switched on. Do not stand or sit too close, your clothing may melt or ignite. 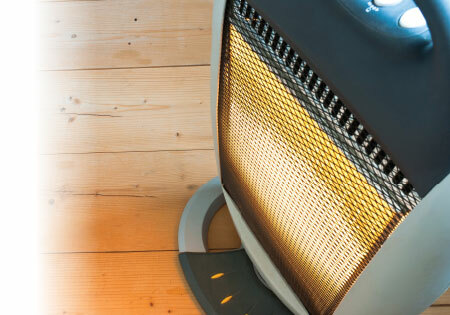 Do not place a heater too close to furniture or electrical equipment. Do not place heaters where they can be knocked over. Many have a function which switches the heater off if knocked over, but this does not apply to all. Do not use flammable adhesives, cleaning fluids or aerosol sprays near a heater. Keep flexes as short as possible. Position the flex so that it will not cause a trip hazard, ensure it will not pass under doors or carpets. Never operate with a worn or damaged flex. For gas heaters, ensure cylinders are changed in the open air. If this is not possible then open windows and doors to increase ventilation. Hot Ideas To Help You Keep Warm. The winter weather seems to come round extremely quickly; before we know it temperatures in the office quickly drop and we start to think about how we can retain the heat. Office temperatures should remain above 16ºC (ideally 21ºC) and when working outdoors the employer should ensure the correct personal protective equipment (PPE) is used. However, even in centrally heated areas there is often a need for a personal heater to ensure all employees experience a comfortable temperature. Small heaters provide a great localised warmth, e.g. near a draughty door or window without altering the central thermostat. For smaller spaces, fan heaters offer a compact heating solution and come with the assurance of overheating protection, whilst oil filled radiators which are usually fully portable, can be carried or wheeled easily, and also offer the benefit of a thermostat to regulate temperature. For larger areas, industrial fan heaters are a great way of blowing out dry heat with no condensation, gas or fumes, as opposed to propane heaters, which are highly effective but do depend on gas. Another option is an infrared heater, these are useful to warm people in large, cold environments like a goods-in dock because they heat objects, not the space, so heat isn’t wasted. If you are in an area where hygiene is important, for example, in a canteen then a convector heater could be the best option, as it does not blow out air and so dust will not be blown into people’s lunches! Take a look at the following product highlights, which illustrate the main differences between the types of heating equipment on offer. This might help you to make a decision as to which product would be most appropriate for your needs. Fan Heaters- These quickly warm up and often have an oscillating function to distribute heat across a room. The heat element can also be turned off so they can work as a fan in the summer. Oil Filled Radiators - Provide a mix of radiant and convected heat and are permanently filled with oil creating an efficient and quiet heating solution. They are portable and often come with carry handles or wheels. Ceramic Heaters - Ceramic heaters are easily portable space heaters and give off a great deal of heat. These are more energy efficient than many heaters, and often have integrated thermostats. Halogen Heaters - Halogen heaters rapidly heat up and cool down, but remain cool to touch in their plastic casings.They emit a radiant heat which heats an object rather than the space. Convector Heaters - These are lightweight and easy to store when not in use. With a near silent operation, they are quick to heat up. These heat the space and not the object. Many convector heaters can be wall mounted. Quartz Heaters - These are radiant heaters, which quickly provide heat to those closest to the heater, rather than providing heat for an entire room. No fumes or noise are produced. ...How Easy It Is To Cut Energy Costs? One of the best ways to cut overheads in an organisation is to look at how much money can be saved on energy bills. Ensure staff close external doors and windows to ensure heat does not escape or fit external door closers to ensure the door closes automatically. Consider the use of signs and notices as helpful reminders. Use solar control window film to make the most of reflected light by keeping buildings warmer in winter and cooler in summer. Use PVC strip doors in warehouse loading bays to reduce draughts and maintain a constant temperature. Don’t heat your premises when it is not needed, for example turn off the heating over weekends or holiday periods.